The relatively mild winter temperatures during the two last decades have led to a resurgence of interest in cold hardy citrus in North Florida. The Satsuma is the most cold-hardy commercial citrus, and they account for most of the new commercial citrus acreage in the Florida Panhandle. 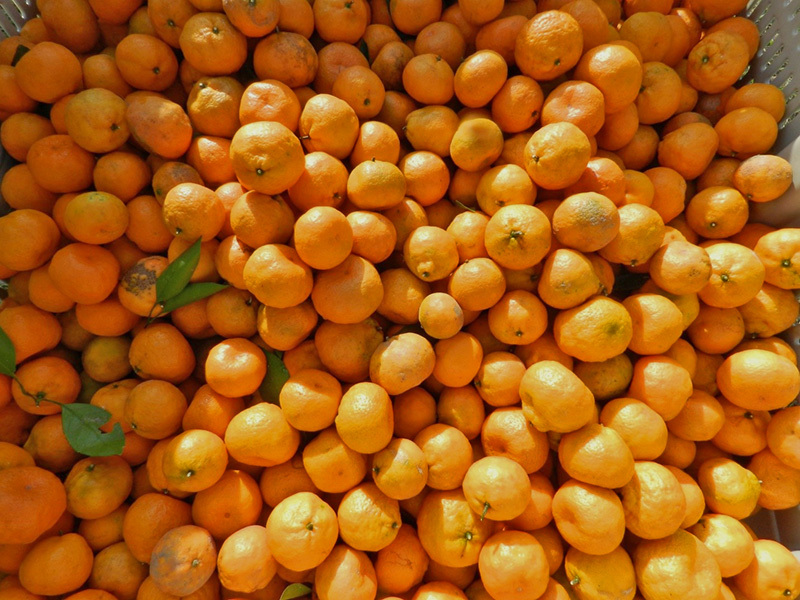 In North Florida, Satsumas are available for a four to six-week window in late October through early December. Unlike many other types of citrus, Satsumas are prone to bruising, they must be clipped at harvest, and handled carefully in all post-harvest operations. In addition, the Satsuma market may be approaching saturation with several hundred new acres in North Florida and in South Georgia. If winter temperatures remain as mild as the last two decades, we can successfully grow other cold-hardy citrus for the fresh market. For example, the coldest temperature recorded at the NFREC – Quincy last winter was 28 ℉. However, there have been temperatures as low as 15 and 16 ℉ over the last ten years. The older, mature trees at the NFREC (Washington Navel, Minneola Honeybell and Valencia) have experienced some tip burn on leaves, but did not sustain any significant damage. An ongoing cold-hardy citrus variety trial has been conducted at the North Florida Research & Education Center’s (NFREC) Quincy Station for the past 14 years. The following citrus varieties have been evaluated: Bud Blood, Early Pride, Glen navel, Washington navel, Minneola Honeybell, Nova, Orlando tangelo, Sugar Belle and Tango. (Please refer to the table 1 for more information on the scion/rootstock combinations). The Satsuma varieties (Xie Shan, Brown Select, Owari) had the highest yield. 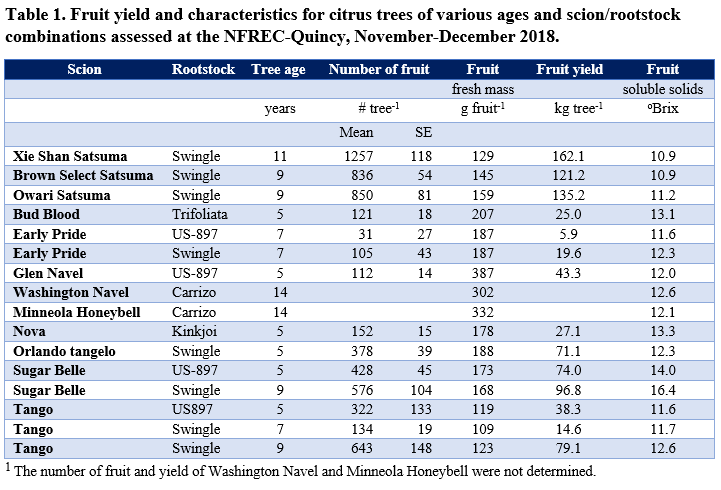 The 14 year old Washington Navel and Minneola Honeybell were observed to have an even higher yield, although yield was not determined for these trees. The yield of Early Pride was low and varied considerably from tree to tree. Orlando Tangelo, Sugar Belle and 9-year-old Tango all produced a respectable yield (an average of 71 to 97 kg per tree). Early Pride and Sugar Belle trees on Swingle rootstock produced a higher yield than trees on US-897. The Navel and Minneola trees produced the largest fruit size (302 to 387 g), and the Tango trees produced the smallest fruit (109 to 123 g). The Sugar Belle fruit had the highest Brix (14.0 to 16.4), and the Satsumas had the lowest Brix (10.9 to 11.2). There may be an opportunity to diversify citrus varieties for North Florida. Based on data collected at the Quincy Station, the Navels, Sugar Belle and Tango may have the most potential of the non-satsuma varieties in our trial. The Navel trees have survived temperatures as low as 15° F with no significant cold injury, and are also resistant to fungal diseases incited by citrus scab and Alternaria. Sugar Belle trees produce a very sweet fruit that is also high in acidity. Sugar Belles ripen in November, but increase in sweetness, if left on the tree into December and January. They are fairly easy to peel, but can have a moderate number of seeds when grown in a mixed block. Sugar Belle is resistant to citrus scab and Alternaria, and there is some evidence that they are somewhat tolerant to citrus greening. Tango is a low seeded Murcott that is small to medium in size, easy to peel, with a ripening date in mid to late December. They will retain a high quality if left on the tree into March, in the absence of severe freeze events. Unfortunately, Tango is very susceptible to citrus scab, which will probably require chemical control. Many new citrus varieties are also being evaluated for cold hardiness, yield and quality at the NFREC-Quincy. These newest varieties include Bingo, Seedless Snack, Marathon, UF Sunrise, UF Glow and many, yet unnamed, numbered selections. We will have data to share on these new varieties in the near future.